I am a fajita-lovin’ girl! I love, Love, LOVE them! That being said, I make them in all sorts of varieties; however, these ones are my very favorite (at least up until this point)! The marinade that is used here is downright delicious. I love how it all melds together in a way that was hard for me to even imagine until I tried it. That lime, Worcestershire sauce, sugar, cilantro, jalapeno, and garlic are so tasty! And, to boost the flavor, you put the reserved marinade on the veggies after you grill them which brilliantly brings all the flavors together in this fajita. I have found great success in grilling these on our charcoal grill, as well as my indoor grill (George Foreman). Why do I know this???? Well, there’s no way I’m prepping the charcoal grill in the snowy winter and there’s also NO WAY I’m living through the winter without my favorite fajita. Thus…I found out very quickly that I can get similar results indoors! I have also found that if I use chicken tenders, then I do not need to butterfly any chicken breasts. This is a small time saver for me so that is usually what I tend to use most. I served these for a dinner party recently and they were a huge hit! 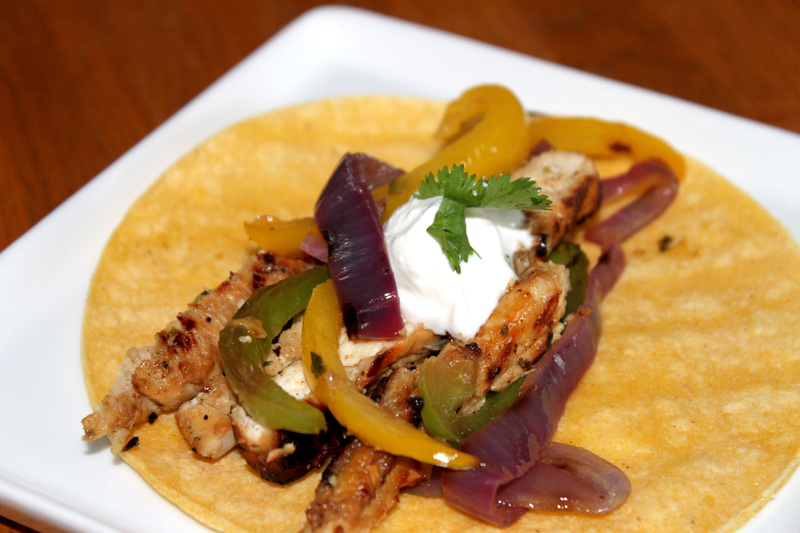 You’ll have to let me know if this variation of fajita makes it to the top of your list too! In a medium bowl, whisk together the lime juice, olive oil, garlic, Worcestershire sauce, brown sugar, jalapeño, cilantro, salt and pepper. Reserve 1/4 cup of the marinade; set aside. Place the chicken breast halves (or tenders, if using) in the marinade, cover with plastic wrap and refrigerate for 15 minutes. Lightly oil both sides of the onion rounds and peppers with olive oil. Season with salt and pepper. Remove the chicken breast from the marinade and transfer to the hotter side of the grill; discard the left over marinade. Place the onion rounds and peppers on the cooler side of the grill. Cook the chicken until it is well browned, 3-4 minutes. Using tongs, flip the chicken and continue grilling until it is no longer pink inside (or an instant-read thermometer inserted into the center reads 160˚ F.) Meanwhile, cook onions and peppers until spottily charred and crisp-tender, about 8-12 minutes, turning once or twice as needed. * When the chicken and vegetables are done, transfer them to a large plate and tent with foil to keep warm. Separate the onions into rings and place them in a medium bowl. 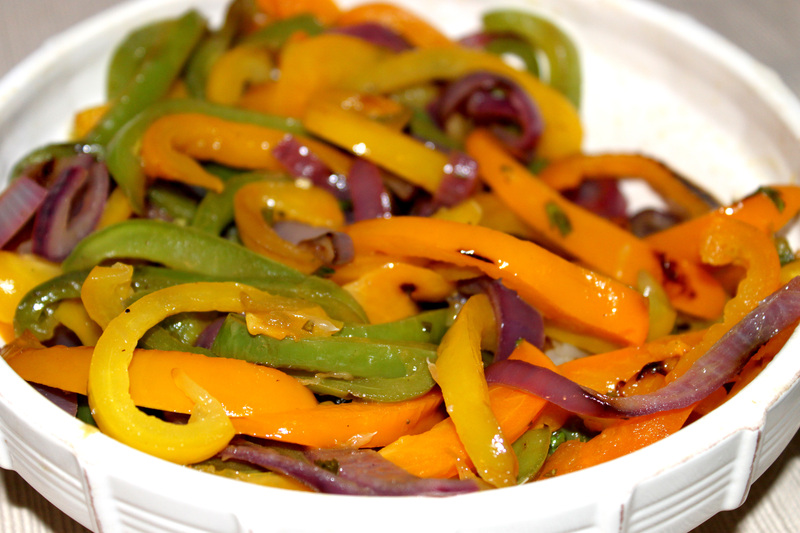 Slice the bell peppers lengthwise into ¼-inch strips and add them to the bowl with the onions. Add 2 tablespoons of the reserved unused marinade and toss well to combine. 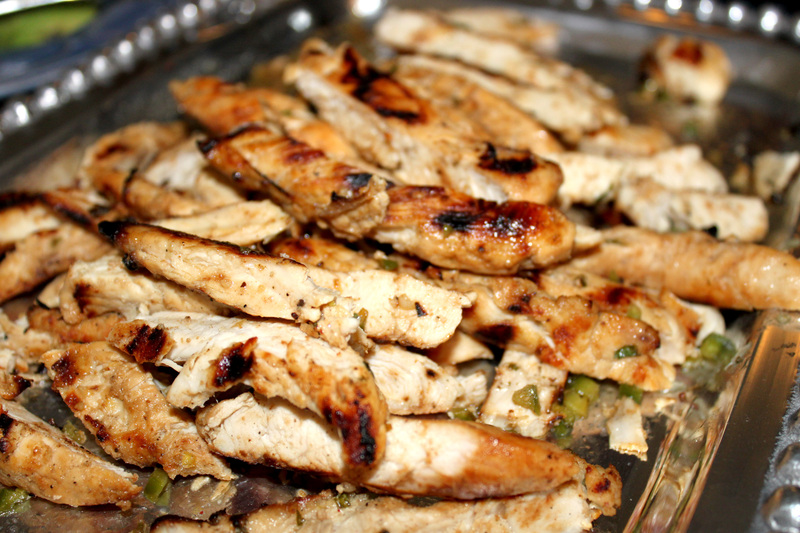 Slice the chicken into ¼-inch strips and toss with the remaining 2 tablespoons of reserved marinade in another bowl. Arrange the chicken and vegetables on a large platter with the warmed tortillas and serve. *Optional Cooking Tip for Veggies: I will occasionally send the chicken outside to the grill with my husband. While he is cooking the chicken, I grill the veggies indoors. I will heat my George Foreman grill. While it is heating up, I cut the onions & peppers into strips. I then lightly grease the grill with cooking spray and then throw the onions and peppers on the grill and cook until crisp-tender and slightly charred. I love a great fajita and this dish definitely looks amazing and easy to make. Thanks for sharing this great recipe. I was at the dinner party, and I can attest to the fact that these are every bit as good as Mimi says!